Eyes and Vision, An Eye Doctor's View: What exactly are Cataracts? Cataracts are one of the most common eye diseases, affecting up to 17% of Americans each year. This number increases to over 91% after the age of 85*. Cataracts form in the lens of the eye, which is a clear structure made of water and protein, located directly behind the pupil (the black circle in the middle of the iris). Light or images are directed past the normally transparent lens to reach the retina and finally into our brains for interpretation. However, as we age, the shape of the lens gradually becomes thicker and less flexible. This process causes the proteins to deform and clump together, resulting in a cloudy/hazy lens. It resembles a dirty camera lens, and as you can imagine, the result is similar - a blurry image! It is known that ultraviolet (UV) light contributes to the formation of cataracts. The lens has protective function in the eye, blocking UV light from reaching the much more sensitive retina. But over time, this absorbed UV light damages the lens itself. Also, certain common prescription medications may accelerate cataract formation, as does trauma to the eye. It may take years or even decades for the onset of pharmaceutically-induced or trauma related cataract formation. What can I do to protect myself from developing cataracts? The easiest step is to wear UV protection, like sunglasses. However, be mindful that not all sunglasses are created equal; in fact, many are not designed to block UV light at all, be sure to look for UV-blocking certification. Furthermore, many of the contact lenses eye doctors prescribe possess UV blocking properties, and our doctors typically opt for these contact lenses as their first choice. Prescription eyeglass lenses can have a UV blocking coating added to them as well. Last, but not least, do not forget the UV protection for your little ones, as the absorption during developmental years compounds and can have consequences later in life! I know that I have Cataracts. Do I need surgery? The first step is to see your primary eye care provider, who will determine if it is truly time for cataract surgery. During this visit, he or she can also discuss the possible risks of surgery (although uncommon), as well as the benefits. First and foremost, clear vision! The surgical implant technologies used today have continued to advance. In some cases, patients may not require full-time spectacle or contact lens correction for distance vision after the procedure. Advanced multifocal implants like ReSTOR, TECHNIS, and Crystalens may provide post-operative vision requiring no spectacle correction at all! Who do I see for Cataract surgery? The doctors at Carillon Vision Care do not perform cataract surgery. However, we are directly affiliated with several Ophthalmologists that are Cataract surgery specialists possessing the newest surgical equipment and best reputations in the North Shore. We often refer patients to Drs. Tamara Wyse (Northbrook) and Randy Epstein (Highland Park) as well as a handful of other trusted surgeons. As a Carillon patient, our doctors will arrange a consultation appointment for you with a surgeon that best fits your needs. We also co-manage patients with these doctors after your surgery has been completed. If you or a loved one are interested in discussing cataract surgery, please schedule a visit or let us know when you are in the office! My sister recently found out that she has cataracts and it's got me worried that I might have them as well. I just moved to a new city, so I'm not familiar with any eye doctors in the area. Maybe one of my new neighbors can recommend one to me? I fond a great info about eye care. In this blog lots of detail had been given for eye's and it's care. We all know that eye is a very sensitive part of human body. A smart wrong work can effect it easily. Thanks for the great information. I've been thinking about getting something like this done sometime, but I just wanted to make sure I knew what goes on during the operation. From what it looks like it really shouldn't be that hard of a surgery. Now that I've read through this I'll probably end up getting this surgery done. 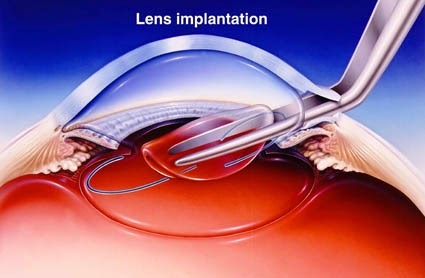 So that is what exactly cataracts are and how it is that eye doctors go about helping people with them. That is a really good thing too, because there are quite a few people out there that have these cataracts. People getting this kind of help from an eye doctor is the best things that you can do to say the least. My grandmother recently had cataract surgery. She hated sunglasses and I think it finally caught up to her. Luckily, I have since convinced her to wear something with UV protection. Hopefully, the surgery will benefit her for years to come. Lasik alternative is ortho k.I prefer SleepEEE Ortho k for my eyes because is approximately half the cost of LASIK and eyemedicsonline 's program offers a 2-year lens life guarantee.